This wine takes its name from a curious fact: at Tenuta Guado al Tasso timid badgers are sometimes seen crossing the fords in the streams. The estate of Tenuta Guado al Tasso is about 80 Km. south-west of Florence near the medieval village of Bolgheri, in Alta Maremma. The 1000-hectare estate extends down the Tyrrhenian coast to the hills where vineyards are cultivated. This wine takes its name from a curious fact: at Tenuta Guado al Tasso timid badgers are sometimes seen crossing the fords in the streams. The estate of Tenuta Guado al Tasso is about 80 Km. south-west of Florence near the medieval village of Bolgheri, in Alta Maremma. 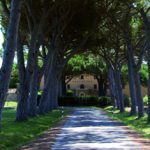 The 1000-hectare estate extends down the Tyrrhenian coast to the hills where vineyards are cultivated. The vineyards are situated on rocky, slightly limestone soil. 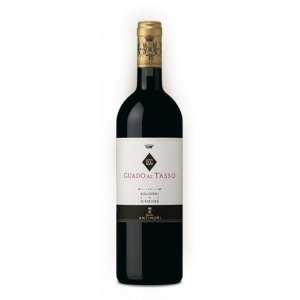 The Guado al Tasso wine was made for the first time in 1990. 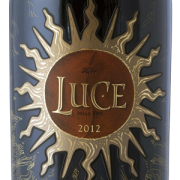 The 2015 Bolgheri Superiore Guado Al Tasso is another star performer from a vintage that was tailor-made by some higher being specifically for the blended red wines of Tuscany. This mix of 60% Cabernet Sauvignon, 20% Merlot, 18% Cabernet Franc and 2% Petit Verdot slides seamlessly right in there with our highest expectations of the iconic vintage. The wine offers beautiful intensity and purity, yet it also delivers balanced power and lasting persistence. 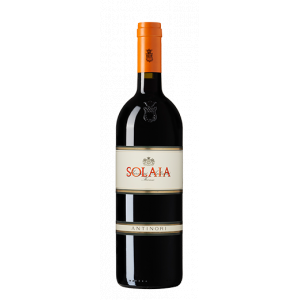 This is a baritone expression from Bolgheri on the Tuscan coast with impenetrable black fruit, chocolate and tobacco followed by rich concentration and tightly knit texture. I tasted this wine next to a barrel sample of the unfinished 2016 vintage. This vintage appears more exuberant and opulent at this early stage. It is a vintage with great ageing potential.